We will continue to update this post with new payroll tax changes for 2014. These changes include withholding tables (federal and state), UI taxable wages and rates, filing penalties, EFT thresholds and more. 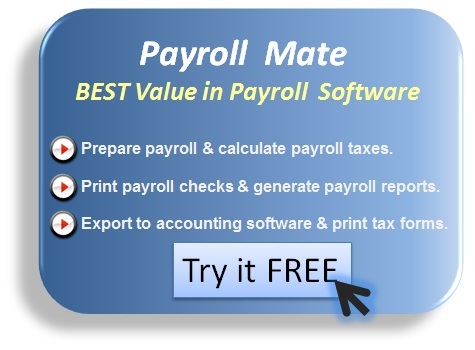 Our Payroll Mate® payroll software helps employers and tax professionals stay in compliance with different federal and state payroll tax regulations. You can download a free trial from here. For tax years beginning on and after January 1, 2014, the lowest tax bracket will be reduced to nine-tenths percent (0.9%) on the first four thousand ninety-nine dollars ($4,099) of net income or any part thereof. Effective January 1, 2014, the taxable UI wage base will be $27,400. (The taxable wage base is currently $26,900).The taxable wage base for Unemployment Insurance (UI) contributions is calculated each year at 66 2/3 percent of the average annual wage paid to Nevada workers. 2014 Taxable Wage Base under UI, TDI and FLI is $31,500. The 2014 wage base is $41,300; in 2013 the rate was $39,800. The taxable wage base is the maximum amount on which you must pay taxes for each employee. The rate is calculated each year based on average wages in Washington. For periods starting on or after January 1, 2014, West Virginia taxpayers remitting any single business tax of $25,000 or more during fiscal year 2013 must pay and file returns electronically for all business tax types, unless specifically excluded. The EFT threshold for 2013 was $50,000. The current California $8 per hour minimum wage will increase to $9 per hour on July 1st, 2014, and will increase to $10 per hour on January 1st, 2016. Effective January 1, 2014 the minimum wage will increase to $8 and hour (currently 7.75 an hour). Connecticut HB 6452 requires all employers to submit their quarterly wage reports electronically beginning in 2014 unless they apply for a waiver. In 2013 the threshold was 250 for filing electronically. Connecticut SB 387 Raises the minimum wage by $0.45 in January of 2014, another $0.30 in January of 2015.